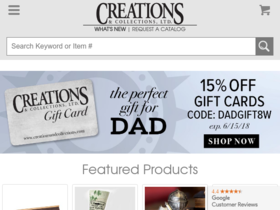 Use this coupon code today to save 25% off gift cards online at Creations and Collections. Shop clearance for up to 75% off creations and collections. Act now and enjoy free shipping with this coupon code from Creations and Collections. Sign up with Creations and Collections for a $20 discount coupon on your order of $125+. Use this code to enjoy low flat-rate shipping on Digital catalog orders. Check out Creations and Collections for their latest special offers.